The Toilet Bowl Cleaners is a guy from Massachusetts. As I wrote last month when I posted "... 2 tracks off their album "Songs About Poop, Puke & Pee." 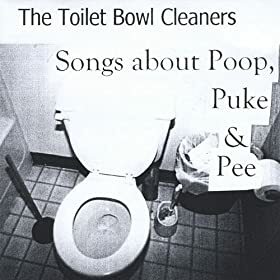 The fact that such an album even exists is amazing; the fact that the Toilet Bowl Cleaners have many albums, all focused on the subject of human waste, and that some of the songs are actually good, is nothing short of mind-boggling. The main toilet-bowl cleaner sez that he's released 8000 songs in the last 4 years. That's kinda prolific." As funny and/or gross as you'd expect, but these simple, catchy Billy Joel-ish piano-driven songs are so obsessively single-minded in their examination of the more taboo aspects of human corporeality that it's kind of impressive. I almost feel like congratulations are in order. He seems to be a sane man, a regular guy, not someone you'd think were you to meet him on the street "Hey, now that's the kind of guy who would record 7 whole albums about bodily functions!" Albums also available thru CDBaby. Apparently he also releases albums as "The passionate and objective jokerfan", mainly singing song about other musicians. There's even a song about Jandek! You may already knew it, but if not, you got a hell of a lot of fun listening ahead. Apparently, as far as i now, it seem that it is the same person (the toilet bowl cleaners) that is ALL of the artists featured on the website. I must admit that i'm a bit scared, but mostly amazed at this mans drive for making music. He's probably not lying when he says that he's released more than 8000 songs. I'd like to know more about him. A documentary would be awesome. Let me just say I’m a big fan. I’ve been listening to your songs for years now and know all the lyrics to every one of your songs. I do have a recommendation of what you should do next; my sister and I have an inside joke about pooping behind the Christmas tree when we were toddlers in our diapers and would love to hear a song about this. I understand you’re a busy guy and everything and won’t feel bad if you don’t have time.